This is basically just sweetened Cherrios. The vanilla flavor it promotes on the box is so subtle - it may as well not be there. This cereal will remind you how good original Cheerios are. It's an awesome taste. For adults, it brings back a flood of taste-triggered memories. For toddlers, it's a great finger food. In the new cereal, every third cereal piece is coated in a sugary yogurt "burst"... so we'd recommend sticking to original Cheerios for wee ones. There isn't much more to say about this new cereal. If you've ever added a few teaspoons of sugar to a bowl of Cheerios... that's what this new cereal amounts to - in both texture and taste. On our golden egg rating scale of 1 to 7, I'm giving this cereal the score I'd give original Cheerios - a 7 - minus 3 points for this cereal being pretty pointless - plus 0.2 points for cool packaging (the side panel opposite the nutrition info) - minus 1 points for General Mills hoodwinking us into thinking we're buying something new. That equals 3.2, which we'll round up to 4. 3/4 cup serving: 2 g fat - 1 being saturated, 0 g trans fat, 0 mg Cholesterol, 24 g carbohydrates, 2 g dietary fiber. Whole Grain Oats is the first ingredient listed. Sugar is the second. What do you think of Yogurt Burst Cheerios - Vanilla? 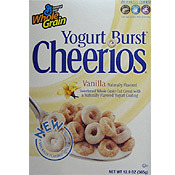 General Mills - bring back the Vanilla Burst Cheerios. They were the best. We have been trying to find this cereal in Hickory, NC. None of the stores have it anymore. Who do I suggest getting it back to? I must admit, I too and quite upset about the loss of the vanilla yogurt burst cheerios. I have continued to eat the strawberry one but recently, I haven't been able to find this on either! Uh-oh, what did you do GM?! I still miss my vanilla yogurt Cheerios, they were the best!! I really liked this flavor because no sugar needed to be added. I am very disappointed that vanilla yogurt cheerios have been discontinued. It's a great loss. I just called General Mills. They have discontinued the product. It happens to be my favorite cereal. The strawberry flavor just does not cut it. The last people on the planet who stocked it was Target. There may be a store somewhere that still mat have it on the shelf. My guess is that the product was returned to GM. Just put some plain cheerios in your own favor of yogurt it is possibly more healthy. I was never much of a cereal eater until I tried the Vanilla Yogurt Burst Cheerios. From that point on, I had a hard time finding it at the store because everyone else loved it too! 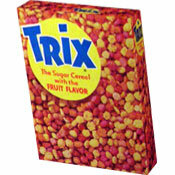 Whenever I did grocery shopping and there were still boxes left on the shelf, I'd buy 2 or 3 boxes at a time. Then, the grocery store chain stopped carrying them altogether! At first, I thought maybe General Mills was just printing new boxes (since there used to be 2 extra "Box Tops For Education" coupons on the front). But now I see the GM website doesn't even list this product. What gives?!!! You'd think a company with good business sense would continue to sell something that is so well liked! I'm very disappointed. PLEASE!!!! Don't tell me they have stopped selling the vanilla yogurt burst cheerios. I haven't seen them for a while but I checked on a website and it didn't say that they were discontinued. The strawberry ones won't probably be as good as the vanilla. So if you want vanilla yogurt cheerios back at all the grocery stores email or call them. That's what I'm gonna do to get my cheerios back. I have begun to encounter problems getting the vanilla flavor at my store as well, and am not happy. I agree with Bob from Ill about Mr. Breakfast missing the boat here, though I'm not sure what round trips to Vietnam have to do with knowing what's good. I also must point out in response to Mr. Breakfast's critique that REGULAR Cheerios list modified corn starch as the second ingredient with sugar third. I'll take sugar over modified corn starch plus sugar as my sweetener. Plus the vanilla is better than he says. I am 60 years old, I have made 3 round trips to vietnam, I know what is good: Vanilla Cheerios are the best I have ever had. You can keep your extremely limited opinions to yourself. My coworkers say these are bad for you. What do you say? I am using them for health and weight loss. I too am unhappy about Vanilla burst cheerios being taken off the store shelves - WalMart and my local grocery store no longer carry them! Two Walmart locations within 20 miles each way of me decided to take the vanilla burst cheerios off the shelf and just sell the strawberry. I am not pleased at all with this, I bought 1-2 boxes per week and now they are not available. Bad move. I love this new product... a nice change from the standard cheerios, and since I can't eat Honey-Nut, nut allergy, then I can eat these for a change-up at any meal... I I have only tried the vanilla but will also try the strawberry... good job! I think that the Vanilla Yogurt Burst Cheerios is awesome!!!!!!!!!!!!!! What do you think of them they stopped selling them here at the military base that my husband is stationed at here in Okinawa Japan I just so mad they done that. I can�t wait to move back to the states for some variety.